[XPB-URI8102FM] *DISCONTINUED* Front Mounted Stainless Steel Washout Urinal is fabricated with a beadblast finish, a continuous flushing rim washes all four sides and the P-trap is fully enclosed and there is no voids, or accessible seams where contraband can be concealed. There are two different Finishes to choose from: Bead Blast (standard) and Polished Stainless Steel. Also, there are five different Low Consumption Flush Valves: Chrome Plated, Mechanical, Hydraulic, and Touch Time Electronic Flush Valve. 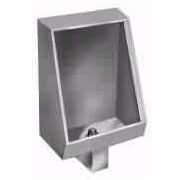 Urinal features a continuous flushing rim which washes all four walls. Specifications and details for upgrades available upon request. For shipping quotes, orders or questions please call our Customer Service Center at 1-877-483-9270.